Valid online or for call-in. Offers not valid on select items and services. This includes Soaps, Skin Care Trial Pack, Nutmilk/Sprouting Bag, or shipping/handling/GST costs. For RETAIL orders only PLEASE. Shipping exclusions may apply to some countries. Please call for orders outside the Continental U.S.A.
Get this free book (a $15.99 value!) with your Fresh Frozen Purchase. Just use coupon code: RENEW during checkout to receive your free gift. One offer per client please. 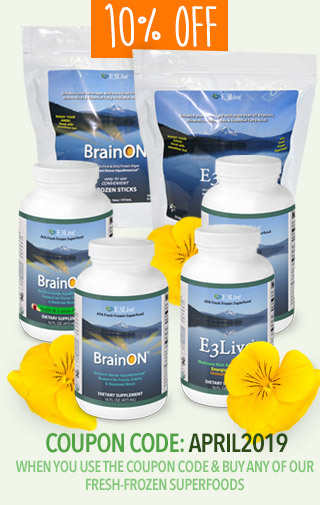 Please keep in mind we always offer quantity pricing (3 or 6 bottle quantities) of these dry goods (capsules): E3AFA, E3 BrainON, E3Renew Me!, E3 Camu Camu, and E3 Enzymes Supreme. We also offer 6, 12, or 24 bottle packs of all our frozen items–stock up today! I have been drinking wheatgrass since I stayed with Dr. Ann Wigmore in the original Hippocrates (back then it was in Boston) in the late 1960's. I drank wheatgrass because I knew it was good for me, but I didn't like the taste and saw that many people could not drink it at all. When Tamera and I tried the wheatgrass from Tom Stem at DynamicGreens, we were really pleased. We knew we had to let our extended E3 family know about it too. We do not usually do any endorsements, but this wheatgrass is better than any we have tried. When I tasted it the first time I could really feel it right away. I know from speaking with Tom that the wheatgrass is field grown and the juice is vacuum packed, flash frozen and unpasteurized. This combination is unique to DynamicGreens and I am convinced that this is why it has none of the bitterness just a fresh delicious taste. Sometimes I like to drink wheatgrass and E3Live together they are a great compliment to one another nutritionally. We also like to put both into a smoothie or green drink for us and for the kids—very tasty! We really like the integrity of the people behind DynamicGreens, they are a great company with great people. They continue to persevere through many regulatory hurdles just to be able to bring their high-quality product to the public in it's most nutritious form. We support them in their mission and we know that this is the best wheatgrass we've ever had!